Hockey fans, NHL players, and NHLPA partners enjoyed a fun, and unique way to spend a warm summer evening last night – by attending a charity ping-pong event at a brewery. NHLPA members and hockey fans put their ping-pong skills to the test for charity at Steam Whistle in Toronto on Thursday night to raise funds for concussion research. The inaugural Smashfest! event, hosted by Dominic Moore and the NHLPA, featured an impressive group of Players, both past and present, including: Dominic Moore, Steven Stamkos, Vincent Lecavalier, Eric Lindros, Jason Spezza, Brett Connolly, Logan Couture, Zenon Konopka, Teddy Purcell, Joe Reekie, Mathieu Schneider, Nick Kypreos, Ryan Shannon, Daniel Winnik, Rob Zamuner, Joel Ward, Wojtek Wolski and Kevin Weekes. 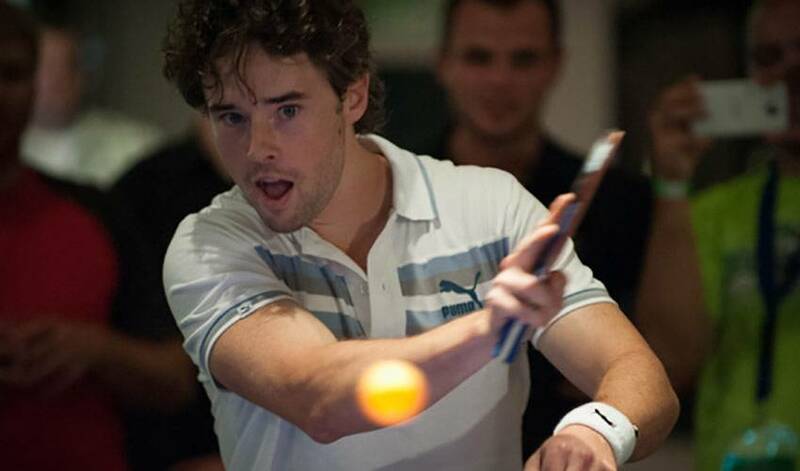 While the event took place during the hockey-offseason, competition was fierce at the ping-pong tables, with players and fans taking part in the action. The MC for the evening was Ken Crosina, a TSN 1050 Radio tennis analyst and former top national tennis player, who provided some great commentary to the crowd throughout the evening. In the doubles tournament, which included both players and fans, Daniel Winnik's team won the title by topping Zenon Konopka's team in the finals. A memorable finals match in the players tournament ended with Ryan Shannon defeating host Dominic Moore in the third set of a best of three final, giving Shannon the championship – and bragging rights – at the first-ever Smashfest! event. On top of all the planned events of the night, a few bonus guests dropped-by to check-out the festivities, including: Claude Giroux of the Philadelphia Flyers; Canadian professional tennis legend Daniel Nestor, who played Moore in a friendly exhibition ping-pong match at centre-court; and MLB players Johnny Damon and Jeremy Accardo of the Cleveland Indians. Throughout the night, those in attendance had a chance to bid on silent auction items, enjoy some food and beverage, socialize, and watch a bit of a ping-pong. Among the various media outlets covering the event, TSN Radio 1050 was on-hand at the start of the evening broadcasting their Cybulski & Company show live.When the paddles were put to rest, more than $20,000 was raised for The Matthew Gfeller Sport-Related Traumatic Brain Injury Research Center and Baycrest's Rotman Research Institute during the first Smashfest! event.